Dubai: A Dh5 billion tower complex was launched on Tuesday by His Highness Shaikh Mohammad Bin Rashid Al Maktoum, Vice-President and Prime Minister of the UAE and Ruler of Dubai. The Emirates Tower Business Park will add a value to the business environment in the emirate and offers a wide variety of top class office spaces for international companies that aspire to move their regional headquarters to Dubai. The project is expected to be completed in four years and will be located in the area between Shaikh Zayed Road and Happiness Road, near Dubai World Trade Centre. 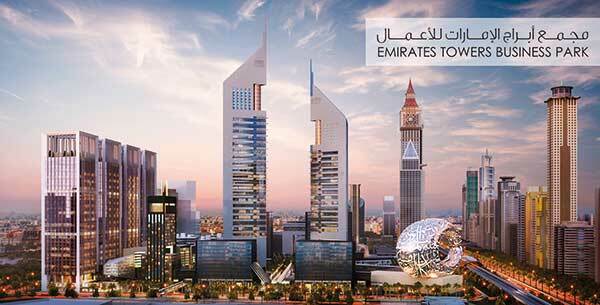 Two covered footbridges linking the project to Dubai International Financial Centre (DIFC) will also be built. “The grand urban development projects which are being implemented across the UAE will strengthen our development strategy in various sectors and support our preparations for the future as part of the overall prosperity being experienced by the country under the leadership of President His Highness Shaikh Khalifa Bin Zayed Al Nahyan,” said Shaikh Mohammad. The park will also house three five-star luxury hotels. A hotel will be managed by Jumeirah Group, while the other two will be managed by leading global hospitality companies. It will include retail spaces for international brands, and a chain of restaurants and cafes. There will be a central area designated for events, in addition to the availability of public areas and parks, and facilities to serve businesses and companies. “With a clear vision for the future and its requirements, our country continues its approach to lay the ground an appropriate environment that ensures opportunities for growth for private corporations and establishments by providing them with innovative solutions that meet the aspirations of investors,” added the Vice President. Accompanied by Shaikh Maktoum Bin Mohammad Bin Rashid Al Maktoum, Deputy Ruler of Dubai and Chairman of DIFC, Shaikh Mohammad viewed the project model and blueprints, and listened to a presentation by Abdullah Ahmad Al Habbai, Chairman of Dubai Holding, on the project’s components and facilities. Al Habbai said that this is yet another project that reaffirms Dubai’s international stature as a favoured destination for regional and international companies that look forward to tapping into promising opportunities and achieving growth in new markets.